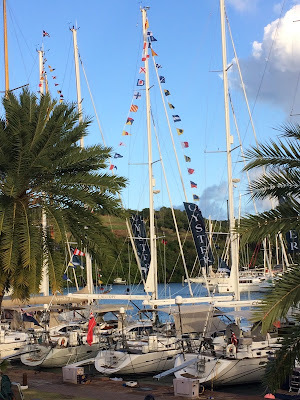 Up till now, we’ve been in Catamaran Marina, in Falmouth Harbour, but once our boom is sorted we’re going to move round the corner to Nelson’s Dockyard in English Harbour, where all 30 of the Oyster World Rally yachts are berthed. It’s an extraordinary place, built in the mid 1700s, with stables, a sailmaking loft, the Admiral’s house and the old slips where ships were launched. Yesterday Charlie, who has been our skipper since last June, left us and moved a hundred metres down the pontoon to take up his new job aboard Miss Tiggy. We had a send-off supper at Papa’s, with a very loud steel band, last night (best onion bhajis ever). We’ll miss him! What else have we been up to? We had our first kiteboarding lesson on Sunday. I was sure I wouldn’t have enough upper body strength to do it, but was pleasantly surprised to find that’s not required. We got as far as being pulled through the water by a kite, with more or less control over our direction, which was exhilarating. Next time, we can try standing on a board. I anticipate lots of wipeouts. 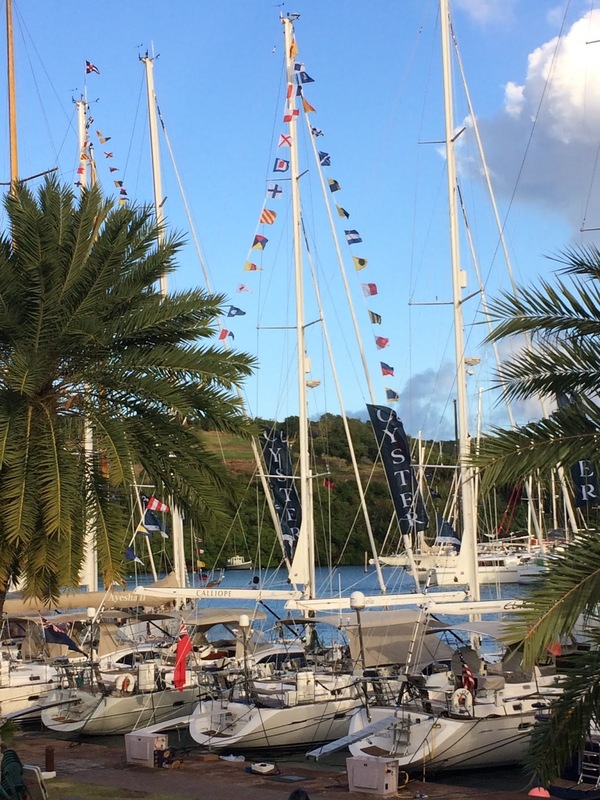 A presentation was arranged by Oyster on tropical weather – basically, watch the clouds and avoid squalls – followed by a session with a charity called Sea Mercy. We had signed up months ago to distribute glasses, both simple reading ones and more complicated “eyejusters”, at remote locations in the Pacific. We’d completely forgotten how many glasses we had ordered and were taken aback, after our training in eye tests, to be presented with 550 pairs! Another exercise in stowage. I’m looking forward to giving them away; I know how lost I feel without my own reading glasses.